I couldn't agree with you more on the manpri's. There is absolutely no way I'd be caught wearing those! Enjoy running Hobble Creek. I'm running the Calgary half largely because it was my first half last year, and I want to see my year-over-year improvement. I sobbed my whole way through that movie last time. I'm about to watch it again to get psyched for my race this weekend. Bring on the tissues. There is just something about watching people cross that finish line. I love Barbie at the top! How did you format that picture to be so big? I can't figure it out. What - you were not the model for your logo? Thank god, she's a stick. I saw far too many manpris in London this past week. Sad. Haha! Didn't know there was a name for them. "Manpris" are not cool. I totally agree. Blech. Glad you got in to the Hobble Creek Half! I can't wait to run it. I've heard so many good things. Oh, and I'll be at the Utah Valley Marathon with a Train4Autism booth. Come see me! Manpris! So funny about the guy in the denim pair. Love it. Too funny on the manpris! Dad Wonder is a biker and I asked him if he wanted some of these for winter riding - he looked at me like I had 3 heads! Oops! So glad you are back running again! Sp funny! Running Manpris are an absolute NO! But I have known a few guys who can pull off the other type of khaki manpris in a tropical setting. But tight, running manpris?? Gag me with a spoon!!!! The new layout looks great! And I love Spirit of the Marathon too! 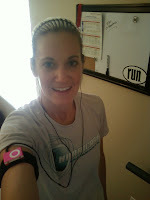 I came to your blog from Marathon mommies. It seems that we probably cross paths in our running adventures-maybe someday we will meet. I'm running Hobble Creek too! It will be my third year in a row-I love it. I'm also running St. George :) Good luck with all your training!